The Jallianwala Bagh massacre happened on April 13, 1919. Over 1,000 peaceful protesters were mercilessly killed on order of British colonel Dyer in Amritsar on the fateful day. Rahul Gandhi pays tribute to martyrs at Jallianwala Bagh memorial. 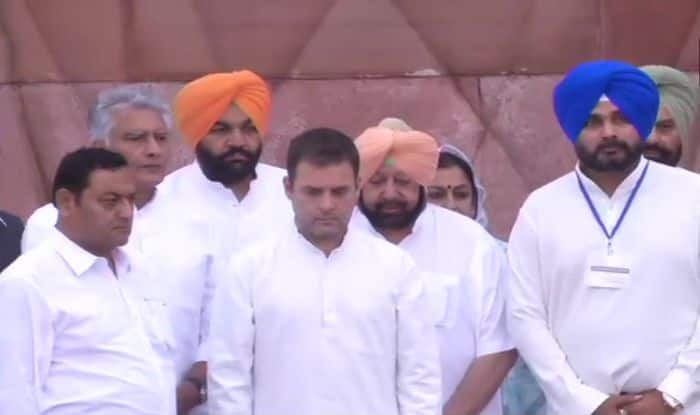 Amritsar: Congress president Rahul Gandhi on Saturday paid homage to the martyrs of Jallianwala Bagh in Amritsar, marking the 100th anniversary of the massacre by the British forces. He was accompanied by Punjab Chief Minister Captain Amarinder Singh and state minister Navjot Singh Sidhu. Meanwhile, Prime Minister Narendra Modi and President Ram Nath Kovind remembered the martyrs of Jallianwala Bagh massacre and paid tribute to their valour and sacrifice. On the other hand, President Ram Nath Kovind remembered the martyrs and said that the ‘the day of sacrifice can never be forgotten’. “A 100 years ago today, our beloved freedom fighters were martyred at Jallianwala Bagh. A horrific massacre, a stain on civilisation, that day of sacrifice can never be forgotten by India. At this solemn moment, we pay our tribute to the immortals of Jallianwala,” the Rashtrapati Bhavan tweeted on Saturday. Notably, the Election Commission (EC) hasn’t allowed observing the 100 years of Jallianwala Bagh massacre on a large scale, a programme commemorating the event will be held in Punjab on Saturday. Only 12 families of those killed in the massacre have been invited for the programme because the state administration failed to trace the descendants of the remaining martyrs. The Jallianwala Bagh massacre took place on April 13, 1919, in which over 1,000 peaceful protesters were mercilessly killed on order of British colonel Dyer in Amritsar.